Having the correct tire pressure on your vehicle is not only a vital safety measure – it also saves money by giving your tires the best conditions to do their job! I know that lots of drivers put off checking their tire pressure, but with the latest digital tire pressure gauges you have the easiest and quickest method ever of keeping your tires safe. The National Highway Traffic Safety Administration (NHTSA) keeps telling us that tire failure causes 660 unnecessary deaths on the road every year. And 33,000 women, men and children suffer substantial, life-changing injuries each year, too, because of under-inflated tires leading to tire failure. 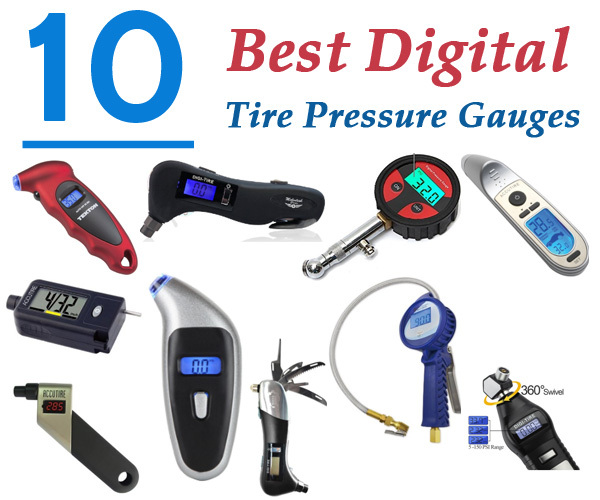 Digital tire pressure gauges are far more accurate than other types of pressure gauge and we’ve chosen ten excellent models that are easy to use and give an accurate measurement on the first try. Some gauges now include a useful emergency kit with various practical tools, including a seat-belt cutter and a window hammer. This another of those simple and obvious ideas we wonder why no-one thought of before, because it can make a huge difference to the outcome of a traffic accident. So all you have to do is browse through the reviews and find the best tire pressure gauge for you. 4. Tools Genie 9 in 1 Digital Tire Pressure Gauge for Cars. Great for Emergencies with 9 tools all in one conveniently small package! With a simple push-button to turn this unit on, you get 4 measurement ranges to choose from. With a small amount of pressure, you can quickly seal the nozzle to the valve stem and get an instant pressure measurement. After use, digital tire pressure gauges have an automatic close-down feature that avoids accidental battery use, so you’ll never be left with a flat battery. Users like the non-slip grip making it easier to line up the nozzle and valve stem on the first try, the LED light that means you can see what you’re doing and the economical price. Long-term users of digital tire pressure gauges say the Duracell batteries in this model last for years. 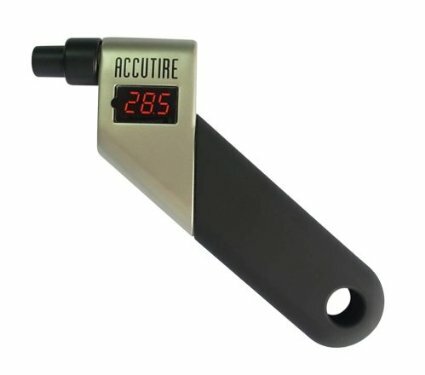 The Accutire digital tire pressure gauges are designed for durability and have a heavy-duty build. The head is set at an angle to make it quick and easy to line-up the nozzle and valve stem and the rubber grip handle is non-slip. 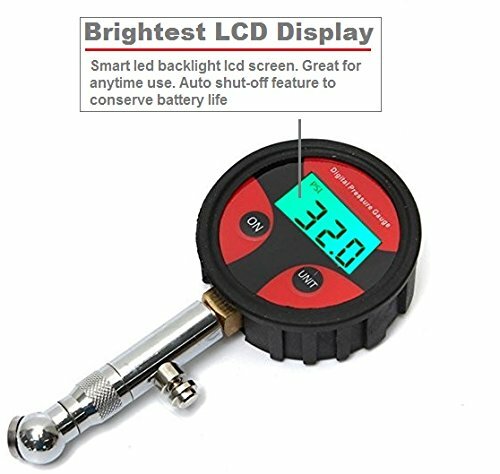 This digital tire pressure gauge has a range of 5 – 150 PSI with an accuracy of +/- 1% + 0.5 PSI, which shows on an extra-large backlit LCD display that’s super-easy to read off. This was a very popular feature with those who submitted digital tire pressure gauges reviews. This unit also has automatic close-down to prevent tire deflation and a replaceable battery is included. This useful car maintenance tool has a large, easy-read LCD display that users say lights-up brightly, even in sunshine, and is always visible at night. It has the same heavy duty build and easy-grip rubber handle that means it can withstand lots of shifting about in a tool-box/glove-box. It’s a very popular improvement on older designs of digital tire pressure gauges and gives a solid reading without leaking air, if the gauge is pushed straight into the valve stem. 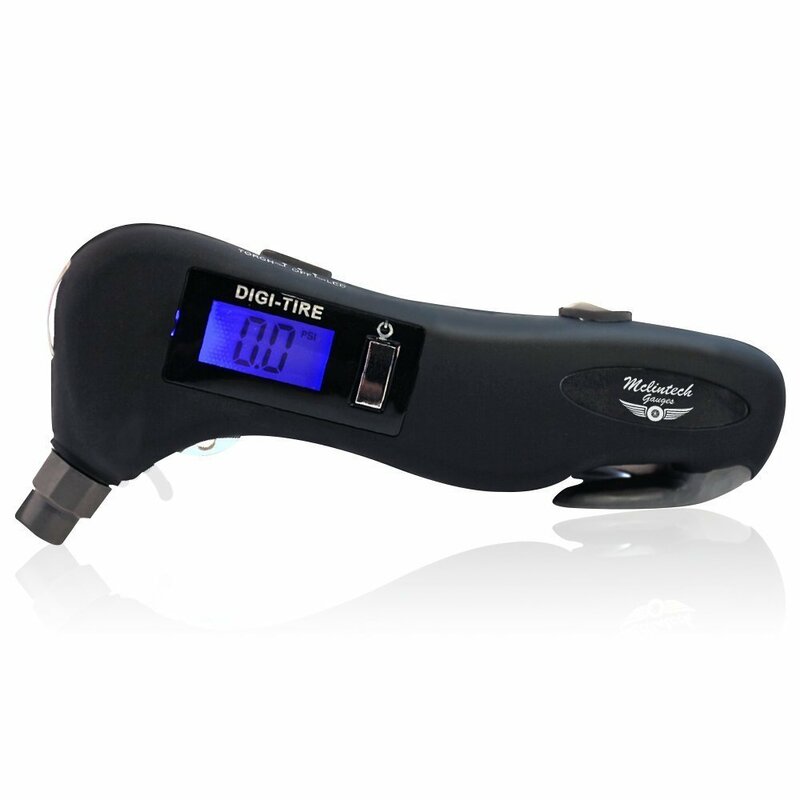 According to our digital tire pressure gauges review group, this is an extremely accurate tool that has all the best features you could need at a very reasonable price. Our team of digital tire pressure gauges reviewers were very enthusiastic about the extra emergency tools included in the design of this unit. These include an red safety light to make it easier to check tire pressure in the dark and an LED flashlight. And with safety firmly in mind, there’s also an emergency seat-belt cutter and a pop-out-window hammer. 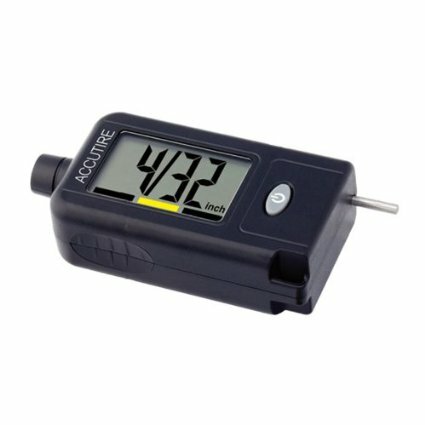 This digital tire pressure gauge offers pressure unit measures PSI, BAR, KPA and KGF/CM2 on Schrader valves, with a range of 3 – 150 PSI in .5 PSI increments and is accurate to +/- 1 PSI pressure range. Reviewers liked everything about this versatile tool! This heavy-duty digital pressure gauge is ergonomically designed to fit large or small hands, so it’s easy for anyone to manipulate. You get an accurate reading straightaway if you remember to keep the digital tire pressure gauge pressed on the valve for 3 – 4 seconds. After switch-off, the next time you turn on the gauge it has a unique feature which shows the last pressure scale used. 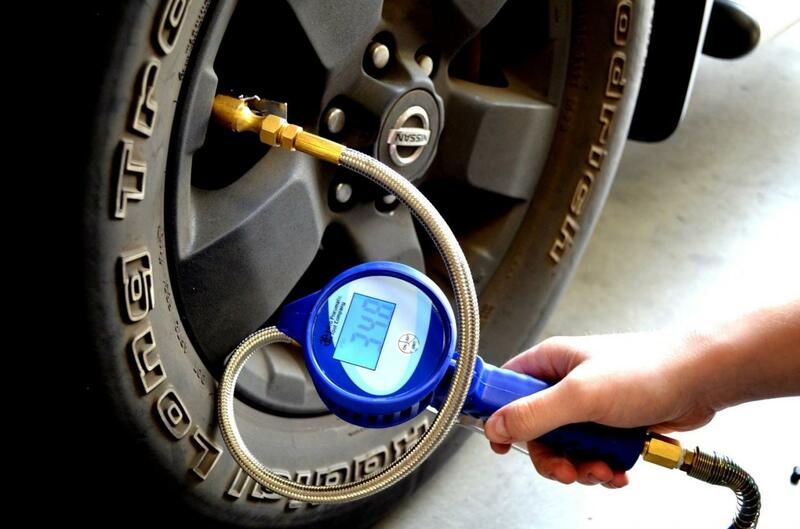 Measures high and low pressure to 0.5 PSI to save gas and extend the life of tires. Our digital tire pressure gauges review group agreed with Ionox that this would make a useful and welcome gift to anyone who owns a vehicle with tires! This has the same features as other digital tire pressure gauges, like large-display with LCD backlight and batteries included. It has a rotating ball air-chuck that gives quick and easy access to the valve stem and holds air-pressure until the bleed valve is pressed. 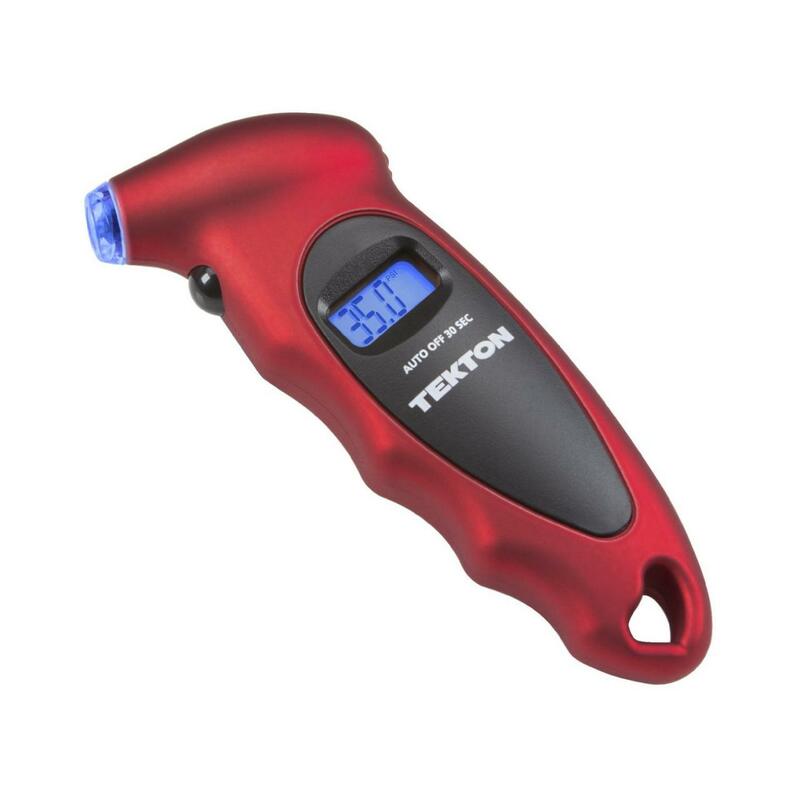 This digital tire pressure gauge is accurate to +/- 2% and has a pressure range of 5 – 200 PSI, with a resolution of 1/2 (0.5 PSI). Reviewers liked the 30 second backlit screen allowing a check of the spare tires in your trunk. The bleed-off valve needs re-setting after each use, but then leaves the reading on display until re-set. This is useful when checking tires in difficult locations. Moving on now to more expensive digital tire pressure gauges reviewers recommended for the Top 10 Best Digital Tire Pressure Gauges. This set includes a tire tread-depth gauge, a window glass hammer, a knife, a saw, a Phillips screw-driver and a flat-head screw-driver, a bottle opener, a red safety LED light, a white LED flashlight, a tire nozzle and a blue backlight. It is also compact and lightweight, which sets it apart from the rugged design digital gauges, and fits in a purse or pants pocket. 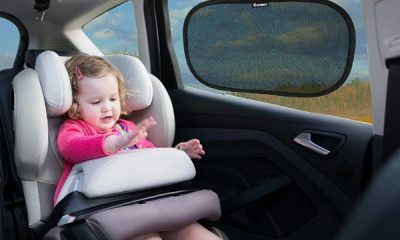 Reviewers think this is also a great gift idea and an investment in your family’s safety in an emergency. 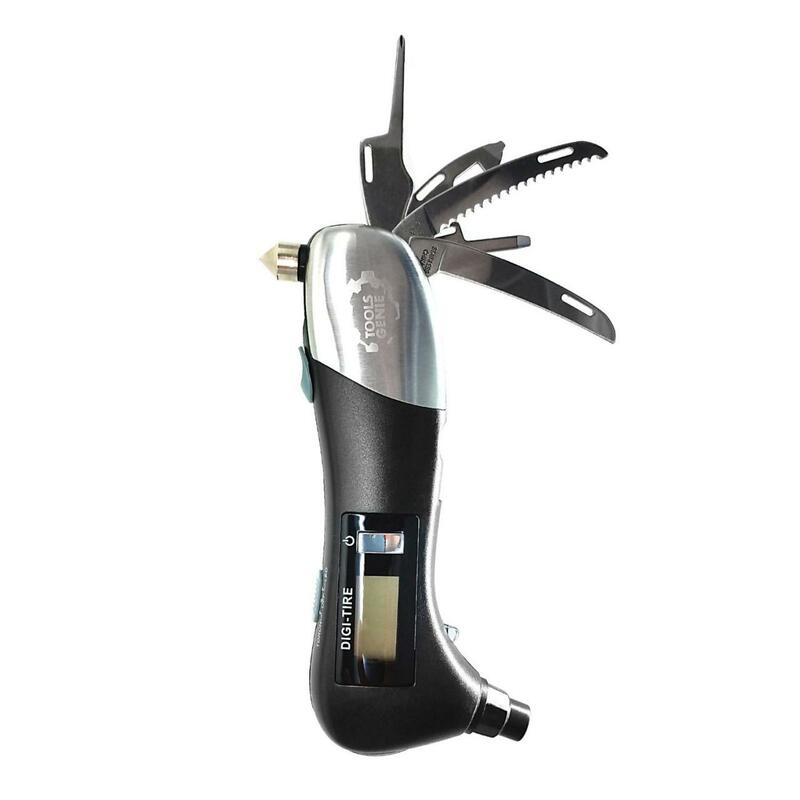 Car air pressure gauge: In addition to a 360º rotating head, rubber-grip and heavy-duty construction, the handy extra features on this digital tire pressure gauge include a knife, a seat-belt cutter, a saw, a screw-driver, a flashlight and a bottle-opener. Our testers commented that it’s simple to get an accurate reading every time, unlike dealing with non-digital gauges and having to make a guess from hash-signs. 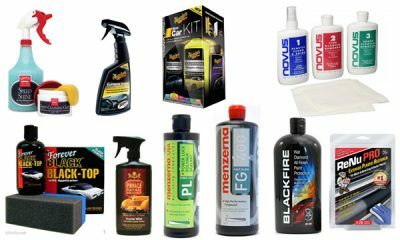 It has a range of 5 – 150 PSI range and users think the price gives good value for money. One suggestion for improvement was that a window hammer should be included to make this model perfect. 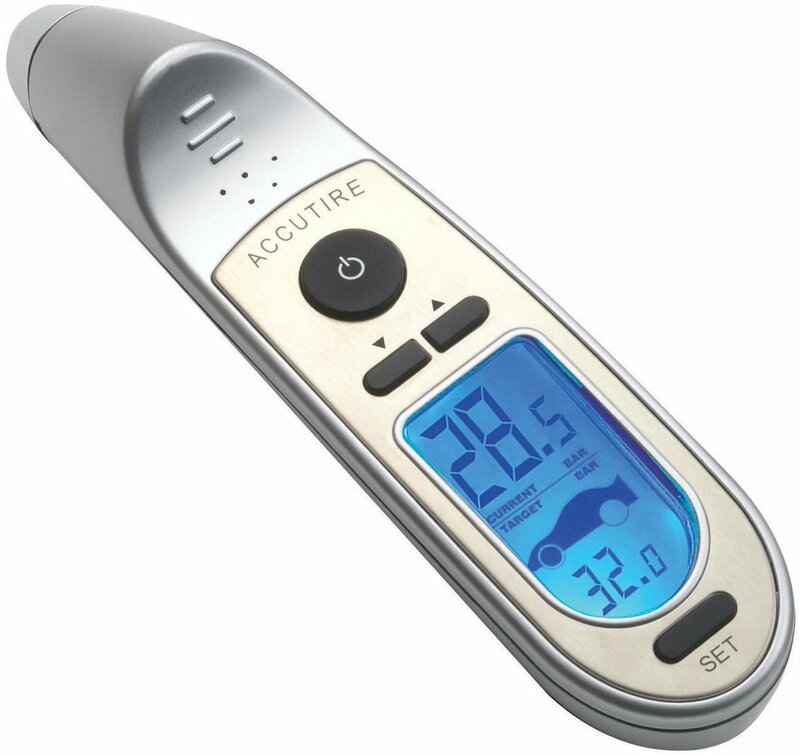 Top rated tire pressure gauge: This silver digital tire pressure gauge’s different from other models because it’s ‘programmable’. This allows the recording of the factory recommended tire pressures for front and rear tires. It reads from 5 – 99 PSI in 0.5 lb increments and has an extra-large, blue backlit, LCD easy-view screen plus an easy-grip, ergonomic shape. 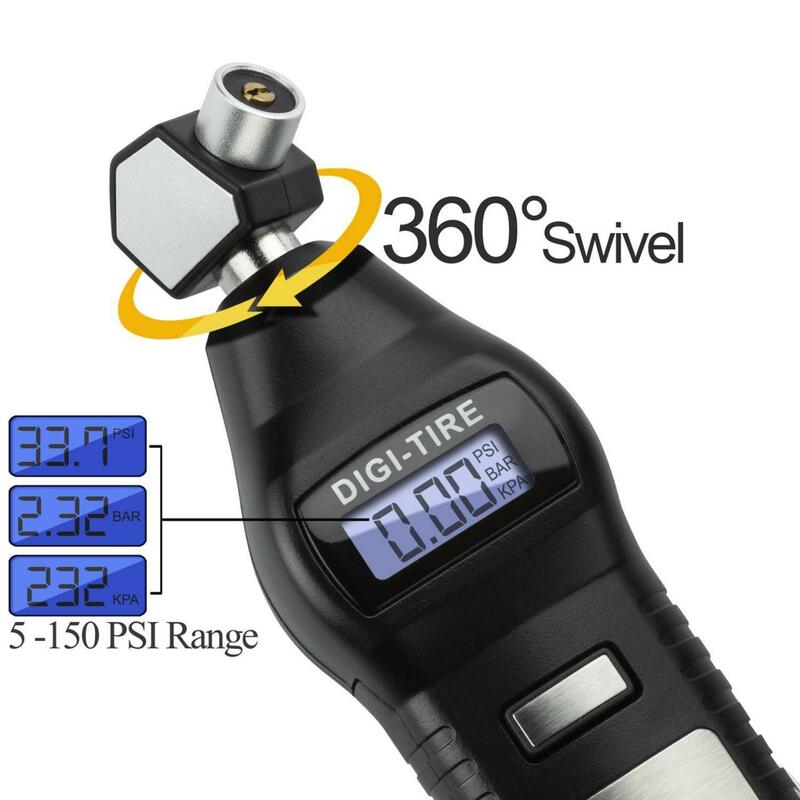 Our digital tire pressure gauge reviewers loved this superior product, but all said it needed an O-ring to get a secure seal on the valve stem. Bit of a design-fail there, but an O-ring costs about 20 cents, is super-easy to fit and made this swanky gauge ‘perfect’! This is one of the most accurate tire pressure gauge. The unit comes with a new 2xAAA battery-powered design, simplified battery installation and lasts 4-times longer than other batteries. This model is a digital tire inflator with a durable 21” stainless braided hose. 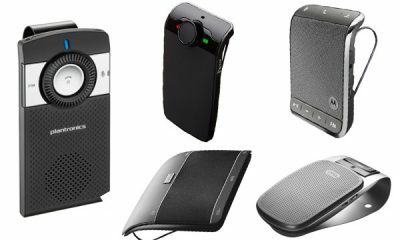 It’s popular with professionals who appreciate the tough, rubber case they can constantly pick-up and put-down without damaging the unit. The inflate/deflate option means you can set tires to the factory specifications easily, whether they started out as higher or lower. This model also gives exceptional accuracy and 0.1 PSI resolution for use with the Tire Pressure Monitoring System. Battery installation is explained clearly in the instructions and takes less than 5 minutes.